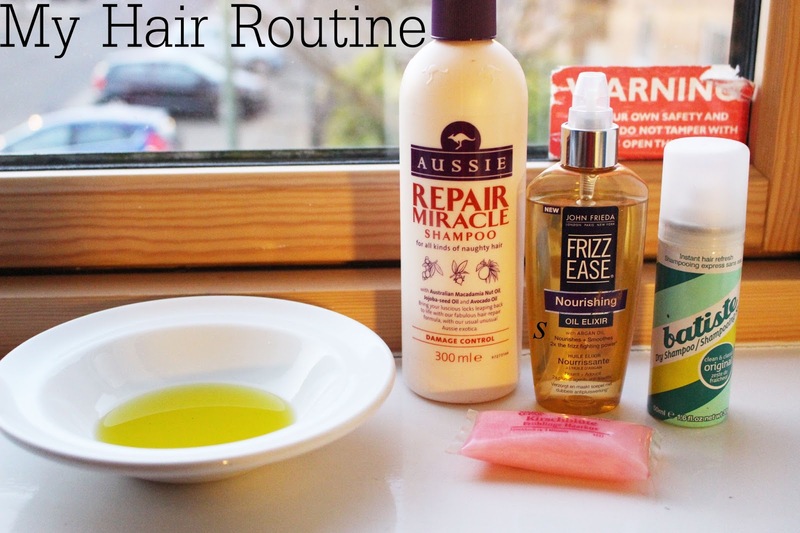 Recently a few of you have requested me to do a post on my hair routine. To be honest I would consider myself lucky when it comes to my hair. After you've read this post you will realise how little I do for my hair compared to my skin. I overall don't like using many hair products and like to keep it quite natural. I straighten or curl my hair for a special night out but on normal days my routine goes as far as picking up a brush and brushing my hair lol. I do have top hair tips that I follow though. I recently had to wash my hair a lot of times in a row. I have been travelling to various cities in England within one week and I hate not washing my hair and body frequently when I'm somewhere new. However, it comes with a consequence. My scalp became VERY dry. Olive oil is your saviour. Heat the oil in a small pan. Brush your hair thoroughly and apply the slightly warm oil onto your scalp and the roots of your hair. Leave it for 15-20 minutes and wash it out of your hair with shampoo in the shower. It brings back all the moisture to your dry scalp. Do this once a week as long as you need to and your problem is sorted. You may notice some hair shedding but don't worry this is just natural shedding. If you brushed your hair properly before this should not happen anyways. After a while my hair just likes to look dead and dry. The best way to bring back life to it is to condition it. The best natural hair conditioner is an EGG. Yes you read right. Use the egg white of an egg and apply it to the dry areas or all of of your hair. Leave it in your hair for 15-20 minutes. MAKE SURE, you wash it out with COLD water. If you use warm water you will end up with scrambled eggs in your hair and I'm not even joking. It has happened to me before. The smell of egg isn't pleasant so you can add a few drops of lemon to your egg white. I can't stress how important it is to use the right shampoo but most of all to stick to the same shampoo. Just like I stress with skincare products it is important that you do not try out too many things on your scalp. It is very sensitive and using too many different chemicals can lead to irritation which then leads to other things such as a very dry scalp. This can lead to your hair getting greasy very quickly. My all time favourite shampoo is by the Australian shampoo brand Aussie. I have been using this shampoo for years. I sometimes try out the different variations of their shampoos but I won't ever swap the brand. You should really give it a try. I feel like this shampoo is not too strong but neither to weak. It is literally just perfect. Give it a try! I would highly recommend the John Frieda anti-frizz hair oil. It definitely works for me. My hair has medium thickness. It's not really thick but neither is it thin. This hair oil works very well for me. Sometimes my hair looks extremely flat and I would recommend using dry shampoo now and then to bring back some volume. My scalp right after applying olive oil. It looks moisturised but it also feels a lot better. Love your post. It's really helpful and informative. Hope to see more of this. Thank you for sharing. Kerastase hair products come in a wide variety of shapes and sizes and can do all sorts of things for your hair styling projects. When it comes to treating hair loss, there are generally four different approaches to consider. While some Dht blocker hair loss conditioner treatments are designed to stop the loss of hair, others promote actual regrowth. Out of the four main methods of controlling hair loss, a contributor to the cause (DHT) is involved in two different kinds of treatments. DHT is a metabolite associated with the well-known hormone called testosterone, which is found in the prostate gland, testes, adrenal glands, and hair follicles. good tips. I've gonna to add some of these products as part of my hair curling tools. Sometimes i do felt the dry scalp, tried some hair treatment product but it doesn't really helpful.